GRAND CANYON NATIONAL PARK, Ariz. — When Asha Jones and other Grand Canyon interns arrived for their summer at the national park, they were struck by its sheer immensity, beauty and world-class hiking trails. Soon, they noticed something else. “It is time for a change here, specifically, at Grand Canyon and in the National Park Service in general, to get people who look like me to your parks,” said Jones, a 19-year-old black student at Atlanta’s Spelman College. The National Park Service, which oversees more than 131,000 square miles of parks, monuments, battlefields and other landmarks, thinks it’s time for a change, too. As it celebrates its 100th birthday Thursday, the agency is facing some key challenges ahead. Among them is reaching out to minority communities in an increasingly diverse nation and getting them to visit and become invested in preserving the national parks. The NPS doesn’t track the makeup of its visitors, but commissioned studies have shown about three-quarters are white. The agency’s workforce is less diverse, at 83 percent white, a figure that can fluctuate with temporary employees. Minorities are expected to eclipse the country’s white population before 2050. The problem of lack of minority engagement is longstanding and complex but can be tied to two main factors, said Myron F. Floyd, a leading scholar on race and ethnicity in outdoor recreation at North Carolina State University. The first relates to cultural traditions. Outings to national parks generally aren’t passed down through generations in minority communities, he said, and few minorities grow up with an appreciation for such sites. Also, for many years, African-Americans were excluded from national parks and other public resources, he said. Barriers to visiting national parks also can be as simple as not knowing they exist, or not having a way to get to them or enough money for entry fees and gear, said Jose Gonzales, Latino Outdoors founder. Asian-Americans, meanwhile, can be reluctant to travel outside their ethnic circles, and they might find few billboards or brochures in their language at national parks, said Mark Masaoka of the Asian Pacific Policy and Planning Council. “It may not seem welcoming or as inviting to go to a place where there are hardly any visitor centers, few signs, and you’re left to figure it out,” Masaoka said. The Park Service has made some changes to address these issues, including recruiting minority interns and producing videos and brochures for Spanish-speaking audiences. Its employees spend time in schools with large minority populations to encourage children to visit the outdoors. The agency also has pushed to designate more sites that highlight the history and contributions of minorities. Some of its newest locations include the Cesar A. Chavez National Monument, established in 2012, and New York’s Stonewall Inn, the first national monument to gay rights, in June. National parks need more support than ever because years of tight budgets have left them with a lengthy and growing backlog of maintenance projects, officials say. The list of needed repairs totaled almost $12 billion as of last year. The Park Service gets help from some outside groups like the nonprofit Rocky Mountain Conservancy, which recently worked to restore old cabins used by research scientists at Colorado’s Rocky Mountain National Park. But that’s not enough, experts say. “I would argue that one of the greatest challenges (the agency) faces in the 21st century is how to engage an increasingly racially and ethnically diverse population in order to maintain the support it has had for generations,” Floyd said. Kristen Smith, a 44-year-old black woman from Long Island, New York, said she and two white friends were subjected to racial slurs and gawked at by visitors during a 2014 trip to Yellowstone National Park in Wyoming. But she didn’t let it spoil her outlook on the outdoors. She particularly enjoyed an earlier visit to Yosemite, where a hiking guide nonchalantly noted black men built some of the park’s first trails. The hundreds of Buffalo Soldiers — members of the nation’s first black Army regiments — were protectors of the land before it became Yosemite National Park, and also served at California’s Sequoia National Park. “The part that was the nicest was having someone so casually mention that, acknowledge the truth,” Smith said. The history of minorities in national parks isn’t always well-known. An annual pilgrimage to Yosemite’s Sing Peak honors Chinese Americans. Frazer Point in Maine’s Acadia National Park is named for a freed black slave who built a homestead on land that became part of the park. Those types of stories are important in selling national parks to minorities, Grand Canyon intern Iesha Baldwin said. Conversations in the students’ cabins sometimes focus on frustrations about seemingly being the only black people in the park. Jaszymne McKenzie, a black intern from the University of Arkansas at Pine Bluff, will return this fall with another adventure to share. 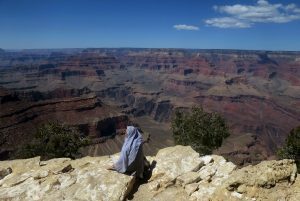 She walked along the East Coast looking at stingrays during a previous internship, and this year watched Grand Canyon visitors marvel at elk and squirrels. The Park Service hopes the interns’ experiences translate into a desire to work for the agency, and McKenzie isn’t ruling that out. She wants to be part of a team that recruits minorities. “It’s the National Park Service. You think, ‘Does it need a marketing team?’ But when you look at it with ethnicities, I would say so,” she said. Fonseca reported from Flagstaff. Associated Press writers Matthew Brown in Billings, Montana, and Brennan Linsley in Rocky Mountain National Park, Colorado, contributed to this report.